At our nursery, we like to offer a nice assortment of ferns. This includes some of the more common types as well as rare and exotic species that are hard to find. If you've come to this page, you're probably looking for a fern you can't find. There are literally hundreds of different types of ferns. Below you'll find about twenty different varieties that we try to keep in stock. Some could sell out. But, we can do special orders for those species if needed. I'm just mentioning the common names, species name and showing photos of nursery plants. No descriptions of species are given here. Sizes available: 1 gallon, 5 gallon and occasionally 15g. 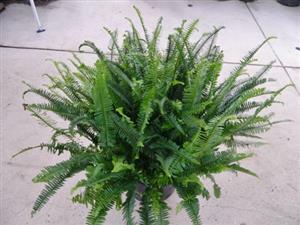 Staghorn & Moosehorn Ferns: Variable prices depending on size. Be aware that we may get different species of ferns in from time to time. But, all above are in limited quantities, so we could sell out of any given species. Special Orders are possible if we don't have what you seek. Check at our Blog for New Arrivals (link below). Sometimes we have ferns on sale!